Oman has a relatively diversified economy, which is dependent on oil exports. 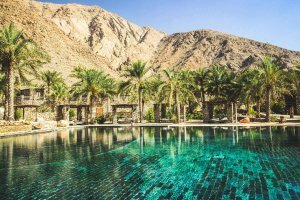 Tourism is the fastest-growing industry in Oman. Other sources of income, agriculture and industry, are small in comparison and account for less than 1% of the country's exports, but diversification is seen as a priority by the government. Oman's proved reserves of petroleum total about 5.5 billion barrels, 25th largest in the world. Oil is extracted and processed by Petroleum Development Oman (PDO), with proven oil reserves holding approximately steady, although oil production has been declining. The Ministry of Oil and Gas is responsible for all oil and gas infrastructure and projects in Oman. Agriculture and fishing are the traditional way of life in the country. Dates and limes, grown extensively in the Batinah coastal plain and the highlands, make up most of the Oman's agricultural exports. Coconut palms, wheat, and bananas also are grown, and cattle are raised in Dhofar. Other areas grow cereals and forage crops. Poultry production is steadily rising. Fish and shellfish exports totaled $34 million in 2000. Oman´s economy is highly dependent on exports of oil and liquefied natural gas. Other exports include chemicals, plastics and rubber products. Oman's major export partners are China, South Korea, United Arab Emirates and Japan. 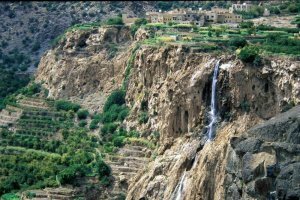 In recent decades the Oman's economy turned almost exclusively to agriculture, camel and goat herding, fishing, and traditional handicrafts. Today, oil fuels the economy and revenues from petroleum products have enabled Oman's development over the past years. The government of Oman is moving ahead with privatization of its utilities, the development of a body of commercial law to facilitate foreign investment, and increased budgetary outlays. Oman liberalized its markets in an effort to accede to the World Trade Organization (WTO) and gained membership in 2000. A free-trade agreement with the United States took effect in 2009, eliminating tariff barriers on all consumer and industrial products, and also providing strong protections for foreign businesses investing in Oman. Tourism, another source of Oman's revenue, is on the rise. Agriculture, often subsistence in its character, produces dates, limes, grains, and vegetables, but with less than 1% of the country under cultivation, Oman is likely to remain a net importer of food. Oman's import commodities include transport equipment, electrical machinery and mechanical appliances, mineral products and base metals and articles thereof. Major import partners of Oman are United Arab Emirates, Japan and United States. Oman, officially the Sultanate of Oman, is an Arab country in the southeastern coast of the Arabian Peninsula. Holding a strategically important position at the mouth of the Persian Gulf, the nation is bordered by the United Arab Emirates, Saudi Arabia and Yemen, and shares marine borders with Iran and Pakistan. Oman is an absolute monarchy. The Sultan Qaboos bin Said al Said has been the hereditary leader of the country since 1970. - An accredited copy of commercial registration and an activity form (or permission for importing if such a form doesn’t exist). - A valid copy of the affiliation certificate to Oman Chamber of Commerce and Industry (OCCI). - A valid certificate from the manufacturer. - A valid quotation list. - Bill of Lading (at sea and air custom offices only). - A manifest of the shipment (a document which contains a detailed description of the cargo). - A permission to deliver goods from the shipping agent. - A comprehensive valid written authorization from the person in charge for customclearance. Filling in the import declaration and form for clearing and classifying the goods according to the Customs procedure. In case of absence of a valid purchase invoice or a valid certificate from the manufacturer, the clearance will cost R.O 20 paid in cash. This money could be reimbursed if the required documents are submitted within 90 days from the date of payment. Provide approval from the authority in charge (for the restricted goods only). Paying the required taxes and custom fees for the total value of the shipment including cargo and insurance (CIF). - A copy from the export invoice. - An application letter for the export of used or personal belongings issued by the employer (for non-Omani citizens only). - Filling in the import declaration and form for clearing, classifying the goods according to the Customs procedure. - Provide approval from the authority in charge (for restricted goods only). Outer cases should bear consignee's mark and port mark and should also be numbered (to accord with packing list) unless their contents are such that they can be otherwise readily identified. Arabic or bilingual English/Arabic language labels or stickers are required for all food products. Production and expiry dates are required to be on all “original” food labels. All consignments of foods must be accompanied by a certificate attesting to freedom from contamination. Carbonated beverages and cigarettes are subject to specific labelling requirements. An international phytosanitary certificate, issued by the Australian Quarantine and Inspection Service, Commonwealth Department of Agriculture, Fisheries and Forestry or the relevant state department of agriculture attesting to freedom from contamination, must accompany all fresh food consignments. Health certification, issued by the appropriate authorities in the country of origin must accompany shipments of plants and their products (including fruit and vegetables) and animals and their products. Fax signatures are not permitted. A commercial invoice, certificate of origin, bill of lading, packing list and a halal certificate (for meat) are required. The documents must be legalised by the exporting country's chamber of commerce. The original commercial invoice must be submitted for legalisation. The invoice should contain an accurate description of goods, including weight, quantities and values. The determination of the true value is important to facilitate customs taxation. The invoice should contain a signed statement that it is true and correct and certified by the appropriate chamber of commerce. signature of the carrier's official acknowledging receipt on board of the goods for shipment. The information should correspond to that shown on the invoices and the packages. The airway bill replaces the bill of lading on air cargo shipments. Imports of plants and plant products require the prior approval of the Oman Agricultural Quarantine. Live plants may not be imported in natural soil, including sand. Peat moss or a synthetic medium is acceptable. Foodstuffs are usually subject to inspection by the Oman Customs authorities. The Ministry of Agriculture, Fisheries, Petroleum and Minerals are responsible for the import of animals and animal products. Importers must provide this ministry with health certificates, issued by an approved authority in the country of origin. In Australia, this authority is usually the Australian Quarantine and Inspection Service (AQIS) or the relevant state department of agriculture. The importation of sheep and goats is prohibited unless prior written permission has been obtained from the Directorate - General of the Ministry of Agriculture, Fisheries, Petroleum and Minerals. Shipments are subject to inspection on arrival.